(Phys.org) —Owlet Baby Monitors, a Salt Lake City business, is self-raising funds for its product, Owlet Vitals Monitor, a "smart" sock on the baby that can monitor vital signs and can send the information direct to a smartphone or other mobile device. The monitor relays such information as heart rate, oxygen levels, sleep position and sleep quality and can give you that data realtime on the phone. The company's goal is $100,000 and it hopes to be able to start shipping in November. It is no secret that information technology is to advance beyond the confines of screen and keyboard, and all eyes are on the future of wearables and the applications these wearables will support. In medicine and general health, it is a no-brainer to imagine the possibilities of wearables providing monitoring information for preventive health, from athletes wearing watches and wristbands to monitor performance to wearables for babies so that parents have peace of mind. Owlet Baby Monitors' device belongs in the latter category and was designed to be tucked into a baby bootie. As the baby sleeps, the smart sock collects the data and sends it via Bluetooth 4.0 to the parent's smartphone. Data is pushed to the cloud and available for viewing on any device with an Internet connection. The device has a four-sensor pulse oximeter, which checks oxygen saturation levels in the blood via a built-in light and accelerometer to measure acceleration forces. For babies, a lot of issues could block their air, from blankets on their mouth to movement, according to the device creators. The oximeter technique emits LED light. 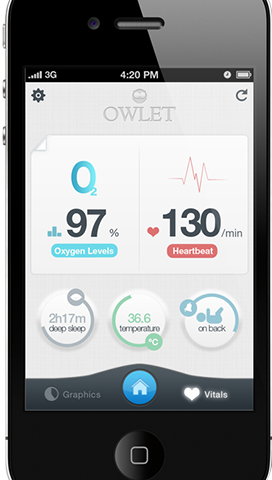 Owlet's accelerometer tracks the baby's movements, providing insight for patents about rollovers and sleep quality. By alerting parents when their child starts to roll over, parents can assess their child's ability to roll back and preempt potential problems. (Parents generally worry about a baby sleeping on the stomach for a long period and how that may put the baby at risk for suffocating.). The Owlet team said the pulse oximeter is guaranteed under warranty for one year. The monitor will continue to work as long as it fits the child's foot, and it was beta tested on infants up to two years old. As for waves and frequency, the team said they are 915Hz or 2.4 GHz. The Owlet Monitor will not receive interference from home alarms, phones or other electronics. The final touches, programming and sock design are finished; the electronics is fully functional and ready to be mass-produced. The company is pricing the monitor at $199 but early-bird units are $159. They noted the monitor can work with an iPhone app and an Android version will be done by the time the product is ready to be shipped. The same apps will be available for tablets as well. According to CNET, the monitor works alongside an iPhone app but it is currently going through Apple's approval process. Another key event for the company would be FDA clearance for a monitor that could qualify as a medical device. The company makes it clear that the product being readied for September is not a medical device, only purposed as a monitor for the parent's peace of mind. As such, the device does not need FDA clearance. Another version that the company has in mind would require clearance. That other version has an alarm system that would alert parents if the baby's oxygen levels or heart rate reached danger points. The company hopes to apply a portion of the crowdfunding proceeds to support the clearance-seeking process. The team anticipates FDA clearance by 2015.